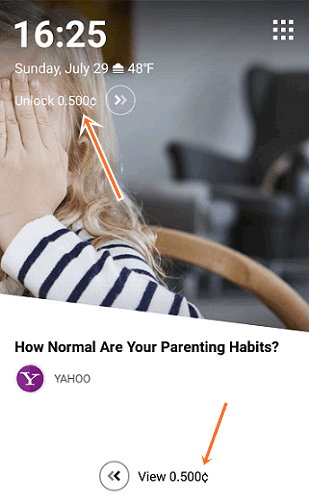 Whaff Locker is a screen lock app which pays you for viewing news and other sponsored content on your lock screen. If you don't know already Whaff has a rewards app too where you can earn money by completing various offers and tasks. To read the review about that app click here. This is the 3rd screen lock app that I've reviewed on InfoSmush. But my personal favorite is Slidejoy. And in this Waff Locker, I'll talk about its features and how much can you earn from it. It is an Android app which pays you for viewing sponsored content, mostly news, on your lock screen. 2? Open the app. After the intro give all the permissions that the app requires to function. 4. If asked for invite/referral code enter this code-JL57887- to get $0.300 sign up bonus. Well… like most of the apps in this category work. They will display sponsored content on your lock screen. You don't have to visit the sponsors’ site to earn. You can simply unlock and you'll still be paid. But you will not earn on every unlock. So you will occasionally earn ¢0.500 for Unlocking your lock screen. Which I know, is not much. But you aren’t doing any work for it anyway. I earn 2-3 cents every day. But your earnings may be less or more depending on where you are. You can watch video ads to earn $0.005 per ad. There are two video ad providers and you can only watch one ad per day from each provider. You can complete offers from AdscendMedia to earn more. You can also earn by completing various offers and playing games from the “WHAFF LOCKER” tab. You and your friends both get $0.300 when they enter your referral code. For example, when you enter this invite code you and I both get $0.300. You can redeem a number of rewards from the rewards store like Bitcoin, PayPal cash, Amazon gift card. Ethereum, Google Play Gift card, Steam wallet and more. The minimum amount of that you can redeem for PayPal cash is $11.5. For this reward, a fee of 13.4% will be charged. Whaff Locker is one of the best screen lock apps that pays you for virtually doing nothing. And since the wallet of Whaff Rewards & Whaff locker is connected you can earn from both the apps and your earnings will stay in one place. LifeSlide App Review: Should You use it?